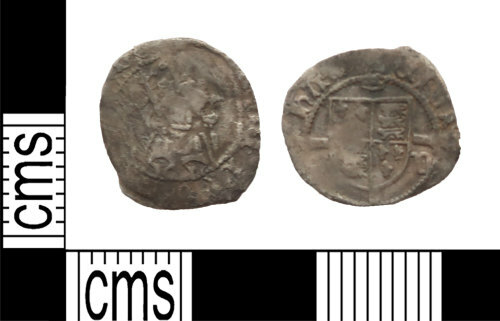 Worn silver hammered post-medieval sovereign penny of Henry VII, dating to 1485 - 1509 AD. Durham mint under Bishop Fox. Obverse of forward-facing king with sceptre seated on throne. Reverse of square shield on long cross fourchee with mitre above shield and D to right of shield; CIVI/[TAS/ DUR]/HA[M]. The coin is 15.80mm in diameter, 0.53mm in thickness and weighs 0.62g.